Kid’s craft should definitely come with warnings. I’m not talking about those warnings such as: WARNING! CHOKING HAZARD- Small Parts. Not suitable for children under 3 years. I’m talking about warnings for parents. WARNING! MUST BE QUALIFIED SURGEON/ENGINEER/ARTIST TO COMPLETE THIS PROJECT! Perhaps, I should have confessed upfront. I have failed kid’s craft again. This time I have screwed up a relatively simple project that any 8 year old could do but was somehow beyond my abilities! I guess that makes me a loser! Make that loser loser! Our latest craft project, aside from obligatory choking warnings, advised that children 6-8 may need some help and children 8-10 should be able to do it themselves. I thought our 6 year old daughter would have no trouble completing it. She is very advanced like most people’s children. What I didn’t envision was that I would have trouble doing it. In fact, that I would sabotage and almost destroy our fairy completely! Yesterday, we visited our local toy shop. So far, so good. 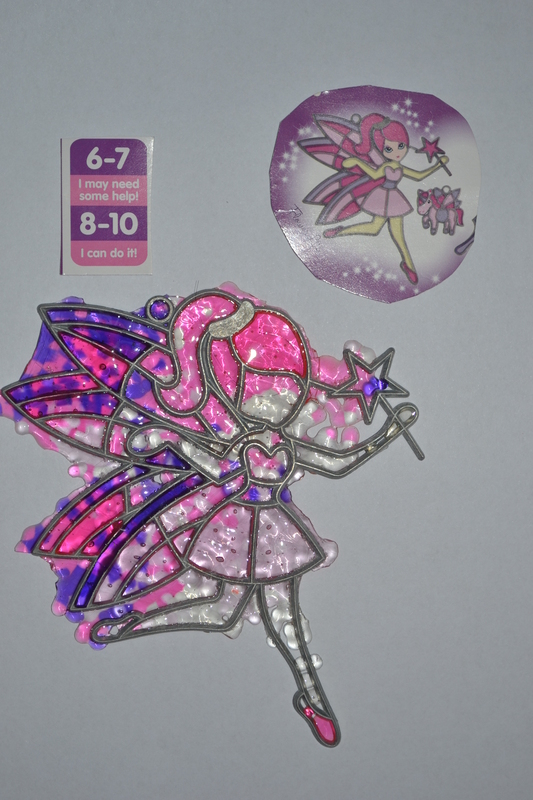 Well, I came across a kit where you can make your own “stained-glass” fairy. She even comes with her own pet unicorn. You simply pour the crystals into the metal frame and put it in the oven to bake. Miss and I were both very excited! She loves craft just as much as I love revisiting my childhood! You see I loved making these as a kid. That’s why I bought it. I remembered pouring the crystals into the frame and then watching them metamorphose like magic in the oven. They were so much fun and so easy. I wanted our daughter to share in the magic. Our son too if he hadn’t disappeared. In all my excitement, I didn’t look that closely at the fairy and didn’t appreciate the fine attention to detail required. The metal frame was indeed quite intricate in places and we needed to apply one crystal at a time with the precision of a micro-surgeon. This is all very well if you are the micro-surgeon type and you have the time to be so meticulous. We, on the other hand, were making ours’ before school. While we weren’t exactly rushing, we didn’t have all day either. As I said before, my experience of making these stained-glass thingys was pouring the crystals into the frame. That is much more my style. I’m much more of a broad-brush kind of artist. Slap on the paint. I need a style which is a bit forgiving and allows a lot of scope for mistakes. Precision isn’t my thing and when it comes to staying within the lines, I couldn’t be bothered. After all, aren’t lines meant to be broken, extended, challenged? Isn’t that what being creative is all about? Miss Perfectionist, on the other hand, is very particular. Precise. Without any consideration for my poor, wounded self-esteem, she very bluntly lets me know when my artwork isn’t up to scratch and doesn’t look like the real thing. She is also 6 and one of the first rules of colouring-in is that you stay inside the lines. I’ve been told before that I need to go back to kindergarten to learn how to colour-in properly. As much as Miss is precise, she is also a perfectionist. Of course, she started off with the most fiddly bit where you could only apply one crystal at a time. She was struggling and quickly became frustrated and that’s when I was called in. My approach of tipping the crystals in wasn’t really appreciated. I also mixed the colours and I thought the fairy would look quite nice in a pink dress with purple spots but this wasn’t good enough. It didn’t meet Madam’s high standards and so she started to remove the offending dots. Well, I obliged and was using a fork to get them out when disaster struck. The fork clipped the metal frame lifting it ever so slightly off the tray and the crystals all tumbled out of position. To make matters worse, I couldn’t wriggle the frame back onto the tray either. It was resting on top of the crystals instead. The crystals had all gone AWOL. On the brink of despair, I shoved it in the oven. It was a done deal! At first, Miss was surprisingly impressed. She was quite excited and told me it was “pretty”. It didn’t take long for either of us to see its short comings. There were quite a few “extensions” added to the frame. You know…extra bits. I even managed to fill up the hole at the top. Yes, that’s right. That hole where you put the piece of ribbon to hang it up. At least, I could have got that bit right! I soon found her chiseling away at these offending additions with a sharp knife. As I carefully removed the knife, once again craft had become yet another lesson in “acceptance”. I know this won’t be our last craft project. As much as I protest, I keep finding more craft activities to frustrate us. For the time being, however, we’re going back to baking. You can’t go wrong with cupcakes! This entry was posted in Parenting, Uncategorized and tagged acceptance, craft, kids on June 4, 2012 by Rowena.